This NASA graphic shows where to look in the constellation Aquarius for the Eta Aquarid meteor shower, which is made of the remains from Halley's Comet. Full May 2010 viewing info. It's been 24 years sinceHalley's Comet last passed through the inner solar system, but remnants fromthe icy wanderer will light up the dawn sky this week in the Eta Aquarid meteorshower. The meteorshower is predicted to peak early on Thursday morning, May 6. Underideal conditions (a dark, moonless sky) about 40 of these very swift meteorscan be seen per hour. The shower appears at about one-quarter peak strength forabout three or four days before and after May 6. The famous Halley's Comettakes roughly 76 years to circle the sun and last passed through our cosmicneighborhood in 1986. Halley's orbit closely approaches the Earth's orbit intwo spots, offering two chances each year to see meteor showers left over fromthe comet's cosmic "litter." One point is in the middle tolatter part of October, producing a meteor display known as theOrionids. 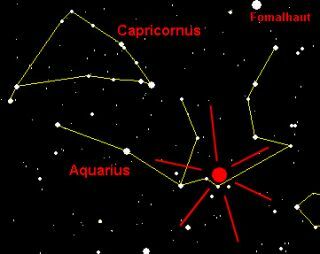 The other point comes in the early part of May, producing theEta Aquarids. First, there is the moon, whichwill be at Last Quarter on the peak morning and will likely "musclein" on the fainter meteor streaks by brightening the early morningsky with its bright light. The other obstacle ? at least forthose watching from north of the equator ? is that the radiant (theemanation point of these meteors) is at the "Water Jar" of theconstellation Aquarius, which comes above the southeast horizon around 3 a.m.local daylight time, never gets very high as seen from north temperatelatitudes, so the actual observed rates are usually much lower thanthe oft-quoted 40 per hour. In North America, typical ratesare 10 meteors per hour at 26-degrees north latitude, half this at 35-degreeslatitude and practically zero north of 40-degrees. Conversely, those who live in theSouthern Hemisphere, where Aquarius rises much higher into the sky, considerthis to be one of the best meteor showers of the year. For most, perhaps the besthope is catching a glimpseof a meteor emerging from the radiant that will skim the atmospherehorizontally ? much like a bug skimming the side window of an automobile.Meteor watchers call such shooting stars "Earthgrazers." They leavecolorful, long-lasting trails. "These meteors are extremelylong," said Robert Lunsford, of the International Meteor Organization. "They tend to hug the horizon rather than shooting overhead where mostcameras are aimed." "Earthgrazers are rarelynumerous," cautions Bill Cooke, a member of the Space Environments team atthe Marshall Space Flight Center. "But even if you only see a few, you'relikely to remember them." If you do catch sight of one earlythese next few mornings, keep in mind that you'll likely be seeing theincandescent streak produced by material which originated from the nucleusof Halley's Comet. When these tiny bits of thecomet collide with Earth, friction with our atmosphere raises them to whiteheat and produces the effect popularly referred to as "shootingstars." So it is that the shooting starsthat we have come to call the Eta Aquarids are really an encounterwith the traces of a famous visitor from the depths of space and from the dawnof creation.